Monica Gale Top STAMPIN'UP! UK Demonstrator: NO SALE A BRATION on these projects..
NO SALE A BRATION on these projects..
Hello there my lovely blogging friends, gasp I took a break for our current Sale A Bration stamp sets to make this beautiful duo for one of my stamping friends birthday. Ok I have to confess that I cannot stop using our satin ribbon, I am addicted to the lovely colours and this pumpkin pie is my fave by far. You know me and my love for bright colours. A mixture of Melon Mambo, Tempting Turquoise and Pumpkin Pie with a bit of Olive thrown in. One of my other favourite things right now is the most gorgeous alphabet called Broadsheet it simply is the loveliest thing, I am working on some scrapbooking projects with it I hope to share with you at some point. Ok I stamped the stem and the dotty leaves from the SWEETHEART set in olive and used the Fancy Flower and the Boho Blossom punches to add a dimensional bloom, pearls were added to the centre of the flower. I have used Ali's initial on her card using the Broadsheet alpha as I know this is an alphabet that she is coveting so I wonder if she will finally cave in and buy it at her next workshop? The tiny bird was stamped, cut out and popped up with dimensionals. Made from one sheets of 12x12 designer paper scored at 3" and folded as a triangle I fiddled about with the bottom closures and Voilà a different type of gift box. I adore the top flower made entirely from the large Heart Punch put through the crimper, a circle of paper was completely covered in snail adhesive and a length of satin ribbon was twisted around to form the centre of the flower. 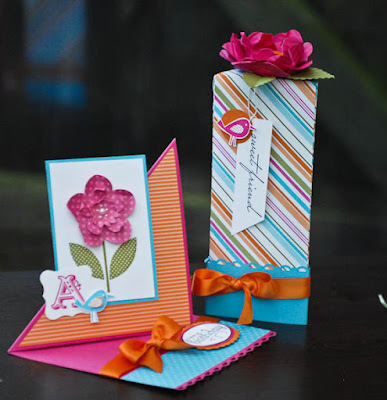 Monica what a stunning card....just love your colour combination on these projects. Hi Monica, these are just fab colours you've used and the triangle easel is fantastic. Love the flower. What a lush colour combo - fab. Love the twisted easel card too. Great colours Monica and it all looks fabulous together. Hi Monica - this set is absolutely stunning - I love the bright colours. I've not seen a twisted easel card before and it looks fab. Would love to know how you manage to make such a gorgeous flower out of a heart punch??! Wow, what a great projekt! I like the colors and the Stamps. I love love love the colors! And the gift set is just a beauty! 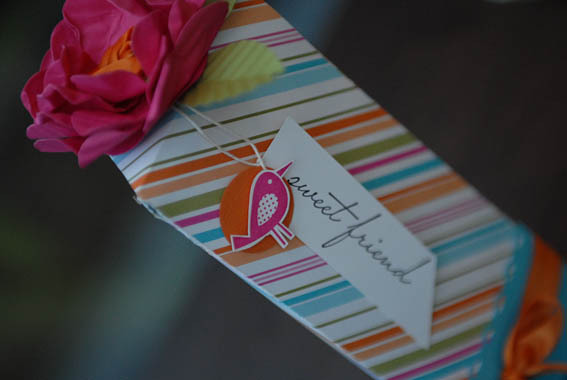 Thanks for sharing, I bet your friend loved it too! Love the card! I haven't seen one like this yet, think I'll have to make a few of these, tfs. These are stunning. I love the twisted easel card - haven't seen them before but will have to give it a go. Love, love, love this! The bright colours are so cheery, absolutely fabulous! I had to go and make a twisted easel card straight away after seeing your delicious creation! Gorgeous Monica! 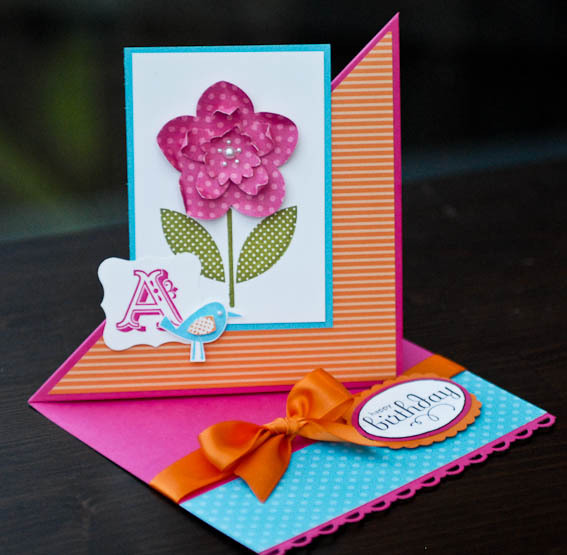 Will have to try this style of easel card, looks very effective.